Jingle Bells, I Love You Too Much! It isn’t healthy how much I love my dog. She is with me every moment I am home. And when I have to go out, I worry about her. So much in fact that I am hesitating even planning a family vacation because I worry how it will affect her. These feelings are so close to how I felt about my children when they were babies and to some extent still now, I feel guilty. In fact, since my kids are getting older and less dependent on me, Bell has eased herself right into the would-be empty nest spots that they used to occupy. Nearly two and a half years ago I decided I wanted a dog. Up until then my husband pretty much forbade me from getting one. I tend to get over attached to animals — okay, let’s face it, I am a sentimental slob and love them to a point well beyond what would be considered “healthy.” Every time we have had any sort of pet, I become so close to them, that when they leave this world, I am a basket case for weeks. I have lost some close family members and a few close friends, but losing a pet is different. It is like losing a piece of yourself. This isn’t to discount losing family or friends, because that is also nearly unbearable, but for some reason I cannot accept a pets death as readily as I have been able to accept people’s. I hope that doesn’t sound harsh. Death is never fair and I am never ready for it, regardless if a person has been ill or has lived a long life, but maybe because when a person dies, a piece of them is carried on in the people whose lives they’ve touched, it is somehow cushioned. My grandmother died nearly 15 years ago and I still think of her if not every day, pretty close. There are so many things I learned from her that I use in my daily life and traditions she instilled in me that it is as if she is still here. I suppose as long as I remember her and the gifts she left me, she will never truly be gone. When our pet rabbit, Pepper died four years ago, I didn’t think I’d ever get over it. We found him after someone set him “free” at a state park. He was a domestic rabbit and would not have made it through the night in the wild. For seven years he was a part of our family. Not to the extent that Bell is now (I tend to think dogs are more loving than rabbits, at least in our case), but a loving addition none the less. Even though he died peacefully and I knew he had lived longer than most rabbits his breed, the loss was palpable. It left a hole in my heart that mere memories cannot heal. To this day I mourn his loss. No begging, no justification, no preliminary conversation to cushion the blow, just “We want a dog!” He sat there a moment staring at us. I assume he was weighing his options. Before he could come up with a million reasons not to, I flipped open my laptop and continued. I told him I had found an 8 week old border collie/Australian shepherd puppy that needed rescuing. I turned the monitor toward him with Bell’s picture full screen. He looked at her and I could see him physically soften. I’d done my homework. One thing my husband could not stand was a dumb dog. I think all dogs are great in their own way, but for my husband, a dog had to be smart. This breed was rated number 1. How much better could it get? Without argument, my husband stood up, walked out of the room, saying over his shoulder, “If that’s what you want.” Done! He might have thought I would follow him to fortify my case for a dog, but I didn’t. I let it go. I didn’t say another word about it. I’d won. He didn’t say no and that’s all I was looking for. The next morning after he left for work, the kids and I got in the car, drove 30 miles to where Bell was and brought her home. When my husband came home from work, I set Bell in the middle of the back hallway floor, right where he would come in. The kids and I hid around the corner and waited. The door opened and in a funny, baby-talk voice that I hadn’t heard since the kids were babies my husband said, “Well hello there! Aren’t you a cutie.” He was hooked. Since that day, Jingle Bells has been our baby-dog. My husband refers to her as our “love child” and “the daughter that loves me.” My daughter loves him, but she is a teenager, so it’s only natural that there be a little friction from time to time. Being a stay-at-home mom, I spend the most time with Bell. I feed her, bathe her, walk her, play with her, and twice a week when hubby is working, she sleeps with me. The other nights she sleeps with my daughter, Gracie. She is spoiled rotten and that’s the way I like it. I look at rescuing her as justification for making her life as happy, fulfilling, and easy as possible. She gives us unconditional love beyond anything I could have imagined, so the least I can do is let her sleep on the couch all day, walk her every morning, play with her, feed her healthy food, and love her with every ounce of my being. See — just like a kid, except my kid’s days of sleeping on the couch all day are numbered, they aren’t much into exercise, playing has nearly been outgrown, and healthy food does not always win over the junk food they try to sneak. Still, there’s the love. I can’t imagine what I’m going to do when something happens to Bell. Just typing that statement my eyes have filled with tears, there is a lump in my throat, and it is taking everything inside me to hold back the tears welling up in my eyes. So today, I am going to love Bell as much as I can, sneak doggie kisses as often as she’ll give them, and do my best to give her the “dog’s life” that she deserves, and for this I am — Simply Grateful. There is more to “working out” than just wearing work-out clothes! Most days I put on these clothes with every intention of working out, yet most days I end up wearing these clothes all day without hitting the gym. It’s almost as if I’ve convinced myself that if I put on the right clothes, I’ll somehow be motivated to go down into the basement and workout in our gym or God forbid drive out to Planet Fitness and actually use my gym membership. I hate exercising. I don’t mind taking Bell for a walk or going for a three mile hike to get my blood flowing, but when it comes to weight training or going to the gym, I have never been good at maintaining a regimen. And this isn’t for lack of opportunity or equipment. My husband has spent years building a professional-style gym in our basement with equipment off Craig’s List. We have machines that could put some gyms to shame. In all he has spent maybe $700, but retail for these machines is well over $10,000. He has gotten machines free or for next to nothing and to top it all off, he has sold pieces we’ve acquired for a profit to enable him to upgrade our gym without having to spend any money out of pocket. Still, going into the basement to workout is not as easy as it sounds. Motivation eludes me most days. This holds true for the kids too. So, in order to make sure my son didn’t become a mush and to give him the motivation he needed, we joined Planet Fitness. This was exciting for the first four or five months. I went three times a week and was really dedicated. Then the holidays hit and I used them as an excuse to cut down on going. Then my father joined and he and my son started going to the gym together, making it all too easy to just stay home and find any excuse not to exercise. I know how important it is to exercise. I know it is not an option, but a necessity. Still, I cannot seem to make this a life-long habit. Today though, I am going to workout. Before I clean one more thing; before I plan dinner; before I finally pick up that Kleenex sitting in the middle of the floor — I am going to exercise. But if I don’t, which I’m not saying is what is going to happen here but if for some unforeseen reason I don’t, at least I’ll be nice and comfy in my workout clothes as I promise myself, “I’ll do it tomorrow,” and for this I am — Simply Grateful. Strawberry Guava Jam And Then Some! There was so much to get done today in so little time (I know the reality of time, but that isn’t going to stop me from denying it) that once again I got up well before the alarm clock and headed down to the kitchen. 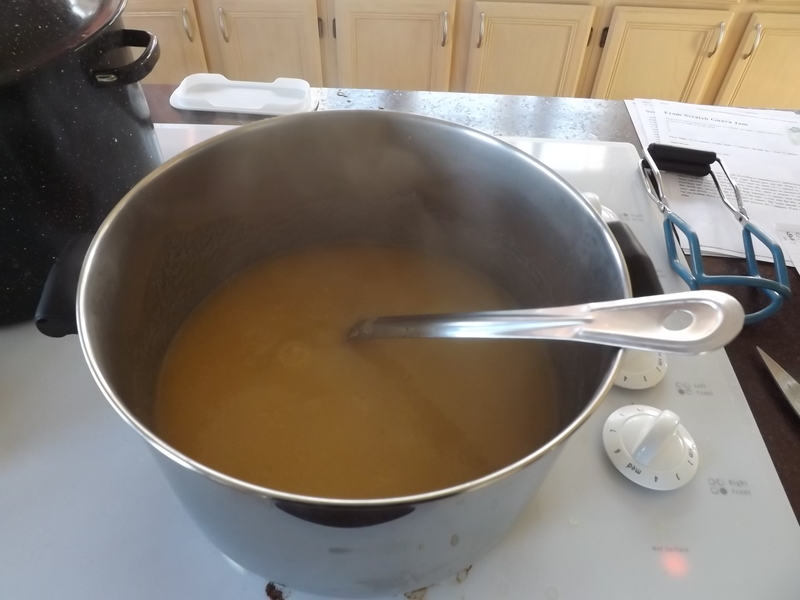 Combine all ingredients in large stock pot and bring to boil. Reduce heat to simmer and cook 30 minutes or until strawberries are tender. With a stick blender, spot puree. This is my cheat for not crushing one cup of the berries prior to mixing with the other ingredients. Depending on how chunky you want the jam, puree to your liking. Remove from heat and let stand five minutes. 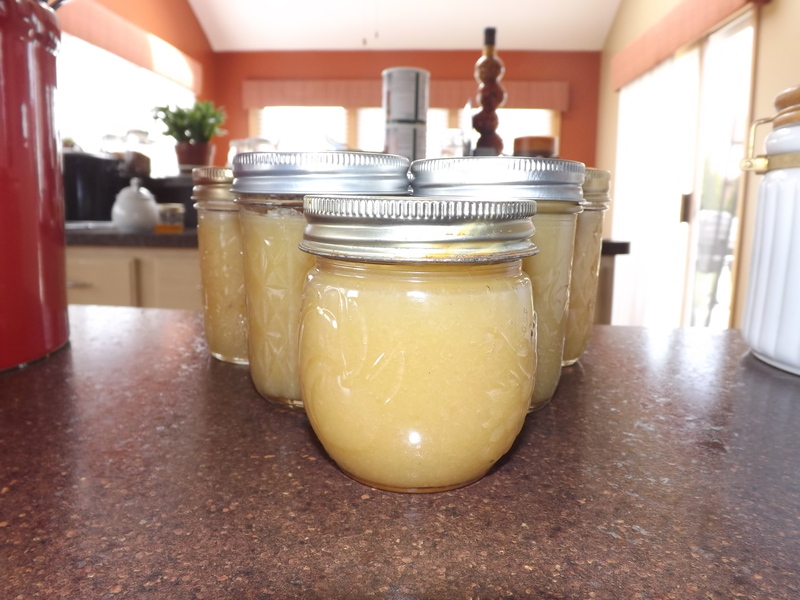 Ladle jam into hot 4 oz. or 8 oz. jars and cap with hot bands and lids. Process 10 minutes in water bath. This jam is not very sweet. My husband loves it because he prefers jams on the tart side, but I don’t see why you couldn’t add more sugar if you wanted. The rule seems to be one cup of sugar for every cup of guava but with the addition of the strawberries, you could easily add two or three more cups to sweeten this up. With the jam done and all the guava used, I moved onto my next project — corn. Over the weekend I came across two boxes of corn-on-the-cob on the discount rack. For $2.00 I got 77 ears of corn. This worked out perfectly because I just finished my last bag of frozen corn from last summer’s farmer’s market shopping. Freezing corn is easy. The blanching only takes five minutes and I enjoy using my little kernel remover gadget to clean the cobs. 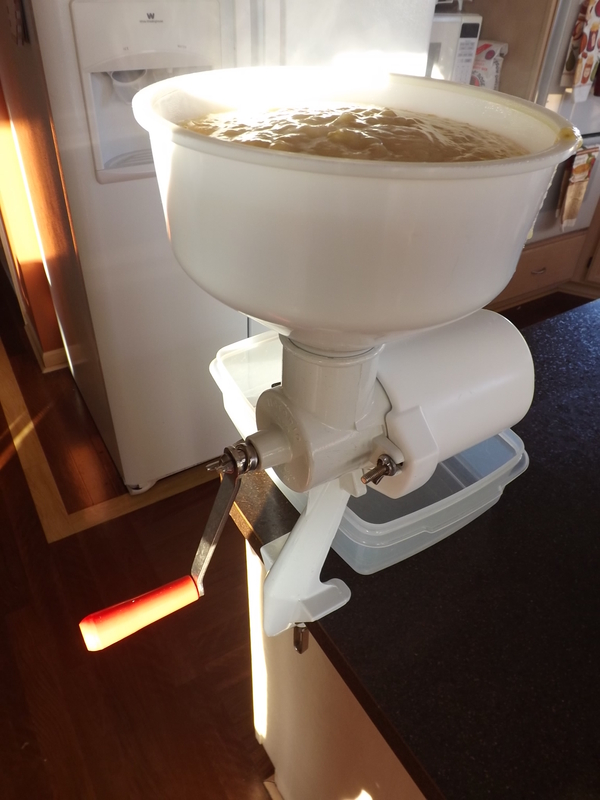 In all, this project took an hour and half and yielded me 5 quarts of frozen corn — more than enough to keep us happy until July or August when Michigan corn starts showing up at the market. 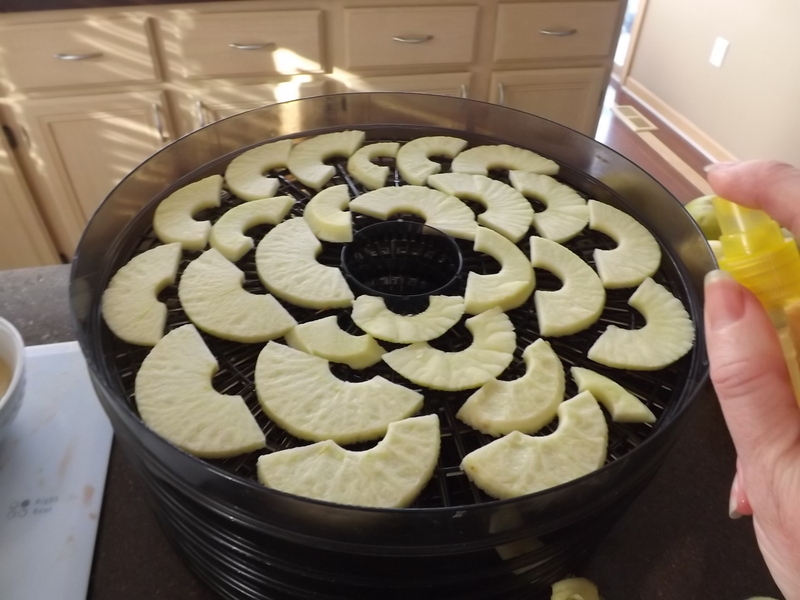 The rest of my day was spent cooking dinner, cleaning the house (well that’s what I call it — others might say moving the dirt from one spot to another), driving my daughter to school and then work, and then finally I ended the day by making another batch of dehydrated apples. That was the other huge find on the clearance rack. I got three boxes of apples for $5.00. I haven’t even finished the first box yet and already I’ve gotten 4 quarts of dehydrated apple chips for the pantry. 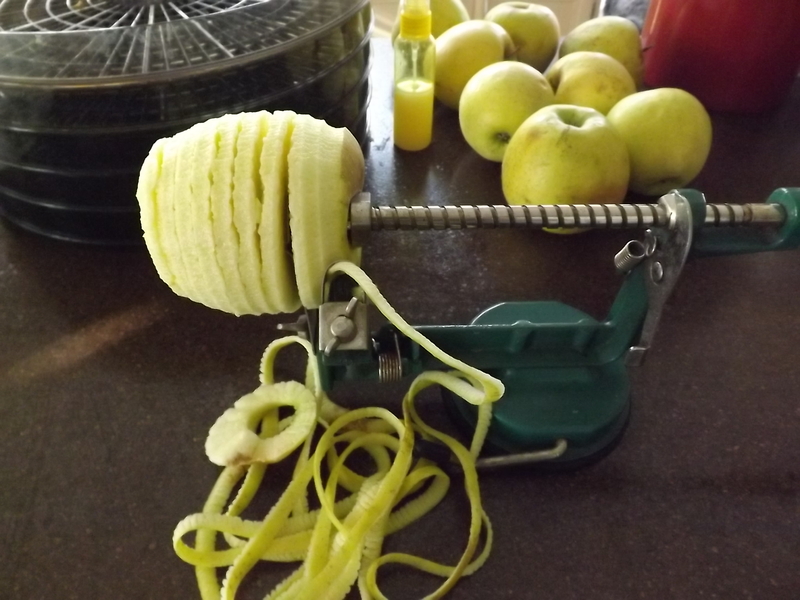 An apple/corer/peeler gadget saves a ton of time. Apples placed on tray – no touching. Love using a spray bottle with lemon juice – so easy! It was a productive day — it needed to be. There is nothing worse than buying produce off the discount rack and then not doing anything with it until it starts to spoil. Yes, I have done this and end up suffering buyer’s remorse, canner’s guilt, and housewife shame for days after. Today I utilized the bargains I bought and added stock to the pantry, and for this I am — Simply Grateful. It has been a hectic Sunday filled with canning, cooking, shopping, and laundry. All of this took precedent over posting this morning, but waiting provided me with something new to share. Yesterday on the clearance rack at Randazzo’s I came across several quart containers filled with a fruit I’d never seen before. On reading the PLU sticker I learned it was a guava. I’d always thought guava were the size of a large pear. These were the size of apricots. Not having any idea what I’d make with them I had to have them, so I bought 3 quarts for a total of $2.00. I also got a ton of other things, very cheap — but more on them in another post. The moment I got home I went to the computer before even emptying the car. I had to find out if there were any great recipes for guava jam online. My search resulted in a few recipes that used a pink guava, one that used the larger green guava I was familiar with, and only one that used the small, creamy-textured ones I’d bought. Not much to go on, but I’d worked with less. I knew that come morning, I’d be ready to experiment. Getting up early this morning, the only morning during the week that I can sleep in, I headed to the kitchen anxious to see what working with guava was going to be like. Not liking most of the methods I found on the Internet for “juicing” guava, I decided to use the method I was comfortable with and use for most fruits. 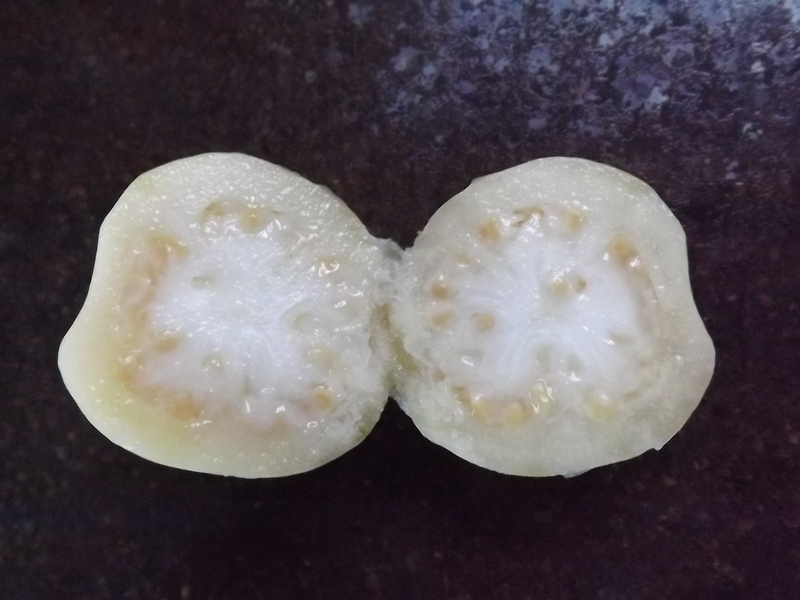 I started by washing the guava and cutting off the flower and stem ends. 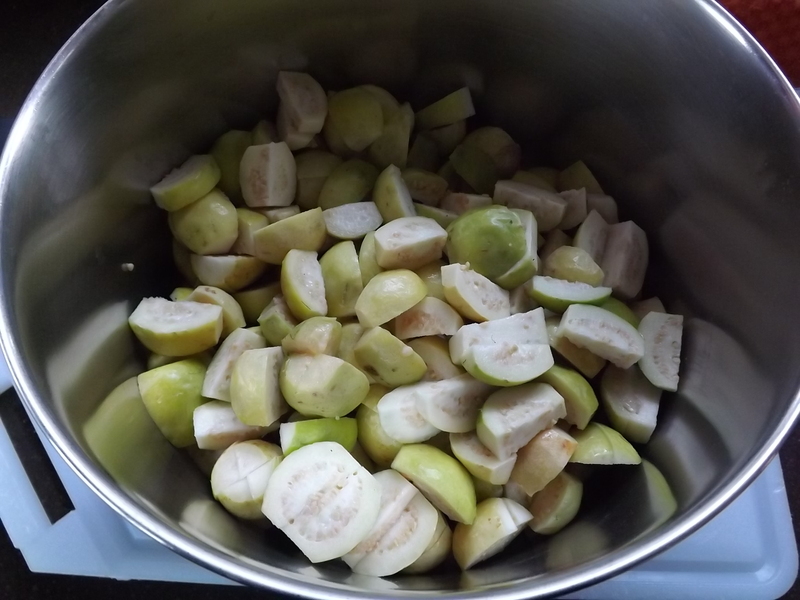 Next I quartered the fruit and put them in a large stock pan – peels, seeds and all. 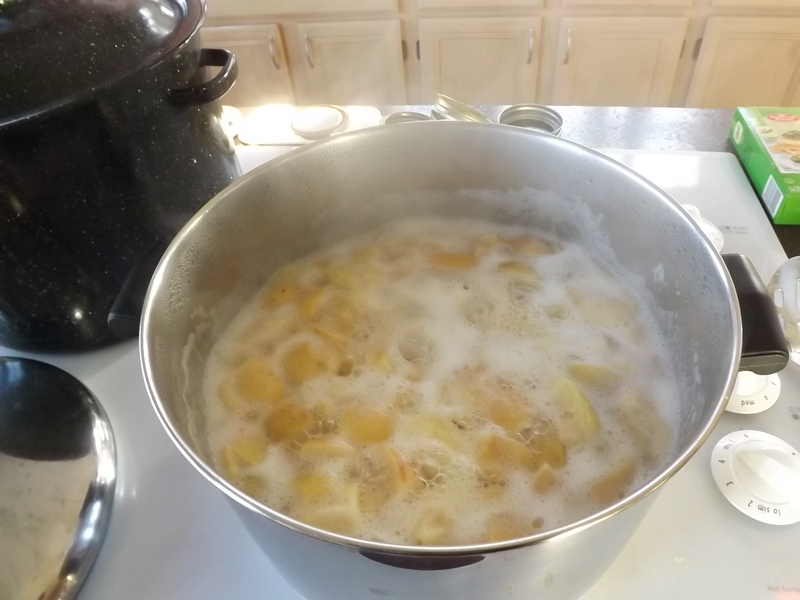 Then I filled the pot with just enough water to cover the fruit and brought it to a boil. Leaving it simmer on the stove for 30 minutes, I tested the guava and found it tender. Cover Guava with water and bring to boil. 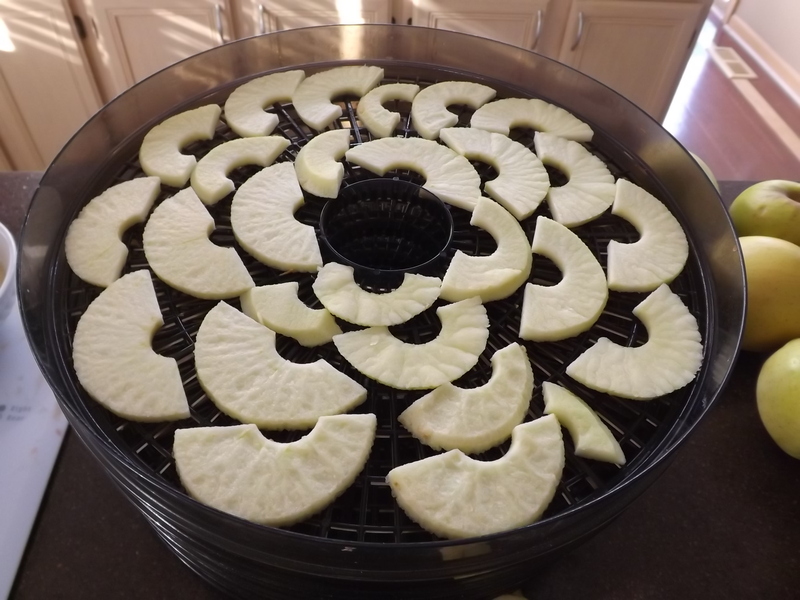 I have found that in order to get the most juice out of any fruit, using a hand mixer or stick blender while the fruit is still in the pan does wonders. 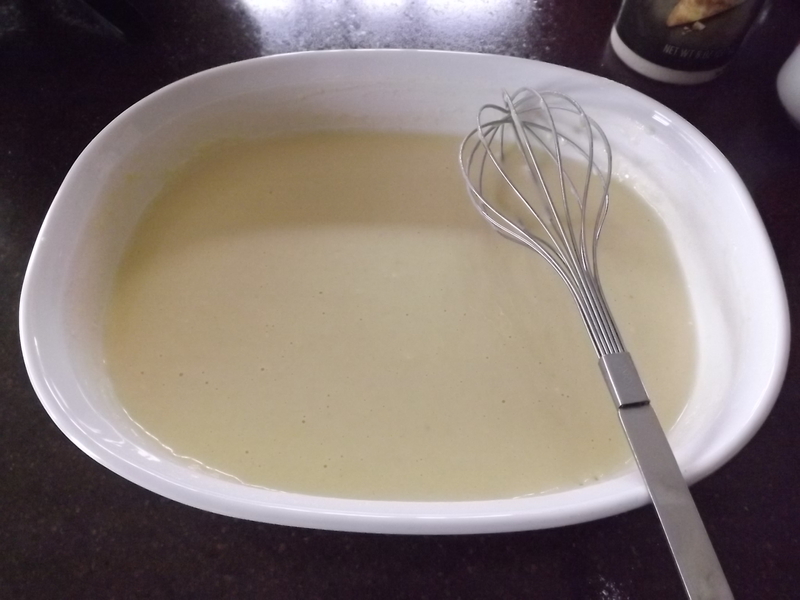 I pureed the fruit until all the large chunks were gone, leaving lots of tiny seeds and a thick creamy mixture. Puree cooked guava till smooth and creamy. Now, either because I’m too lazy to stand there with a strainer or too impatient to wait for the juice to filter through cheese cloth, I pulled out my Victorio Strainer. Fitting it with the berry attachment I poured all the boiling liquid into the hopper and strained out the skin and seeds. Some of the seeds did crack during the process, releasing a tiny poppyseed-size seed into the juice. This didn’t bother me, but if you wanted to I’m sure you could strain this out with a fine mesh strainer. Pour puree in strainer to remove seeds and skin. 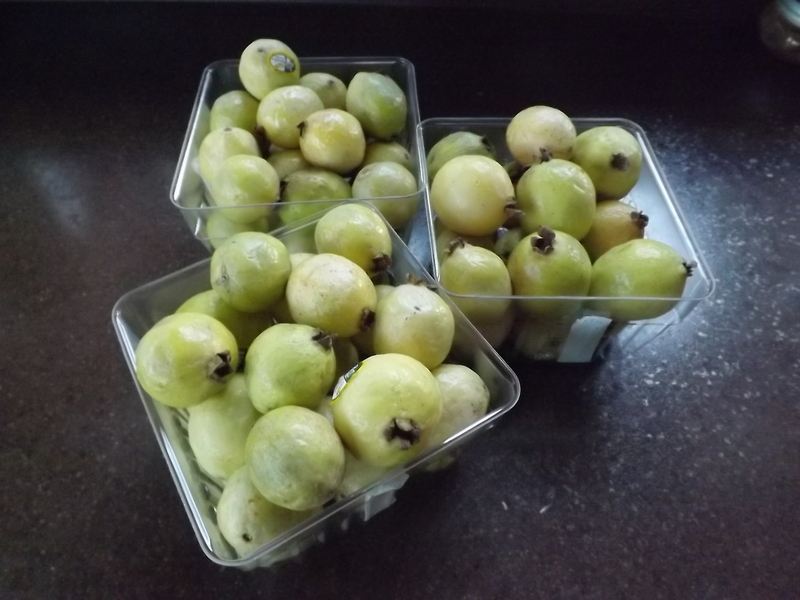 The three quarts of guava I bought yielded nine cups of strained guava pulp/juice. It was very thick and smelled almost citrusy. I put 6 cups of the pulp back in the pan, added 3 tablespoons lime juice, and 4 cups of sugar. Bringing this to a boil I then added one pouch of liquid pectin and let it boil for one minute more. I’m not sure the pectin was really necessary because the jam already was fairly thick, but I figured it couldn’t hurt. 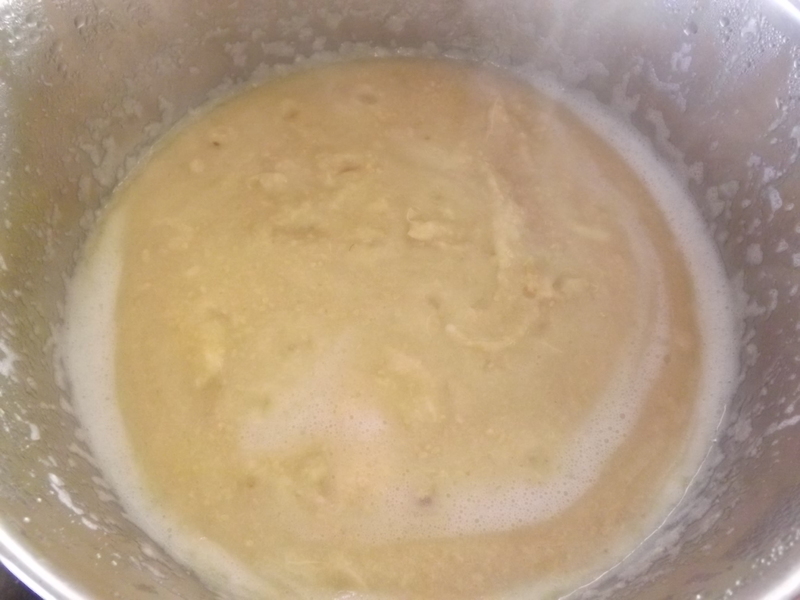 Return pulp to pan – add lime juice and sugar. Finally I ladled the jam into hot 8 oz. jars, covered them with hot lids and bands, and processed them in a water bath for 10 minutes. I filled six jars and another small bowl that I put in the fridge. There was a little jam left in the pan, which I left there for my next project — some sort of guava-fruit combo jam. I tasted the jam while it was still hot and wasn’t sure what it tasted like. It had a bite to it, it was sweet, but unlike anything I’d ever made. The whole house smelled like guava. Then it hit me. I knew this fruit. I might not have seen it in its fruit form, but back some eight or more years ago we went to Punta Cana in the Dominican Republic for a family vacation. Every morning they served fresh squeezed juices in the dining room. The one that all of us drank and enjoyed the most was the guava. It was thick, creamy, white and very sweet. Obviously they had added lots of sugar and more water than I did to make the jam, but the flavor was certainly reminiscent. After removing the jars from the canner, I tasted the cooling jam in the refrigerator. Wow! Cold the flavor was so much stronger. Very unique. I liked it. So what could I do with the rest of the guava pulp and the little bit of jam left in the pan? Leaving the canning so I could do some grocery shopping, I headed to Meijer’s. I ran into several workers that I have come to know over the years. Going to the same grocery store for 20+ years, you make friends. Needing some input on my guava dilemma, I asked for suggestions for a fruit that would go well with guava. My thought was possibly pineapple, but one of the women ate guava regularly and thought that a perfect combo would be to add strawberry. Done. I picked up two quarts of strawberries and now have a canning project for tomorrow. Trying new things is scary, but what’s the worst that could happen? I’d have wasted $2.00 and a little time. 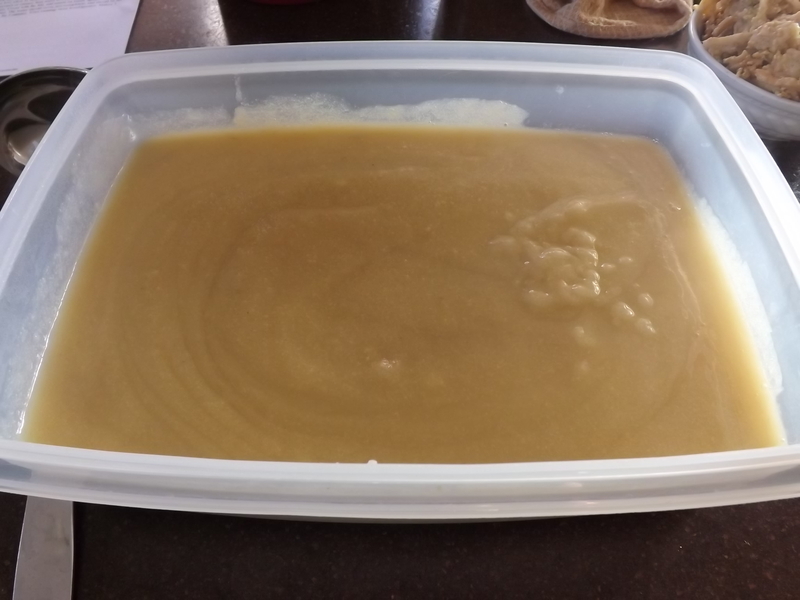 What I gained was a new recipe, the satisfaction of utilizing years of canning experience to “fudge” my own recipe, and I got to enjoy a trip down memory lane recalling the wonderful family vacation we had in Punta Cana, and for this I am — Simply Grateful. If wishes were fishes, we’d have a fish fry. One of the most challenging aspects of living in the “suburbs” is getting along with the neighbors. We built our home more than 20 years ago in a subdivision of more than 1,200 homes. This opened up a world with every type of person you could imagine. When we first moved in, the majority of the homes were owned by young families. There was the occasional bachelor, a few retirees, and a few homes with two or more extended generations. On our street and directly surrounding us there was a mix of young and old and for the most part we got along fairly well. Twenty years later, we’ve watched the neighborhood grow-up, age, suffer through illness, die and then slowly a new generation is beginning to join the mix. We hadn’t planned on living here this long, but the economy hasn’t been kind. Our dreams of moving out farther into the country, buying a plot of land, and leaving suburbia have all but died. Still, we have been very lucky in that several of our neighbors are “old timers” like ourselves and been here since the subdivisions inception. These neighbors have evolved from passing acquaintances to friends that we can count on. This is what has made living here tolerable. Yesterday our neighbor John came home from a morning of fishing on his boat. I watched as he backed his boat into his garage and then sat in a chair cleaning fish. While he worked, our dog Bell sat in the middle of our yard staring at him. He knew what she wanted — a treat. You’d think after three years she’d finally stop playing this game of cat and mouse and go up to him for her treat. I think she must like the game though because this is what they do every time John opens his garage. John called to her several times for her to come and get her treat. Bell kept still. Not so much as standing up. I could hear John explaining to her that he was busy and couldn’t come to her. Bell didn’t care, she kept her vigil, staring him down, doing her best to break him. Well, it didn’t take too long. With fish still to be cleaned, John got up and walked to where Bell was sitting. Before he got within arms length however she ran away barking. So John turned, pretending he was going to walk away. This made Bell bark even more as she turned and chased after him. When he turned to face her, again she turned and barked as she ran away. This little game went on until finally Bell ran right up to him so he could give her the treat. The moment she had it safely in her jaw, she sprinted all the way back to our yard. I couldn’t help but wonder, if I went and sat in the middle of our yard, would John give me a treat as well? Later in the afternoon, John walked across our yards and met me at the back door. In his hands he had a plastic bag with four large, freshly cleaned and boned walleye filets. And I didn’t even have to play cat and mouse with him. Dinner! 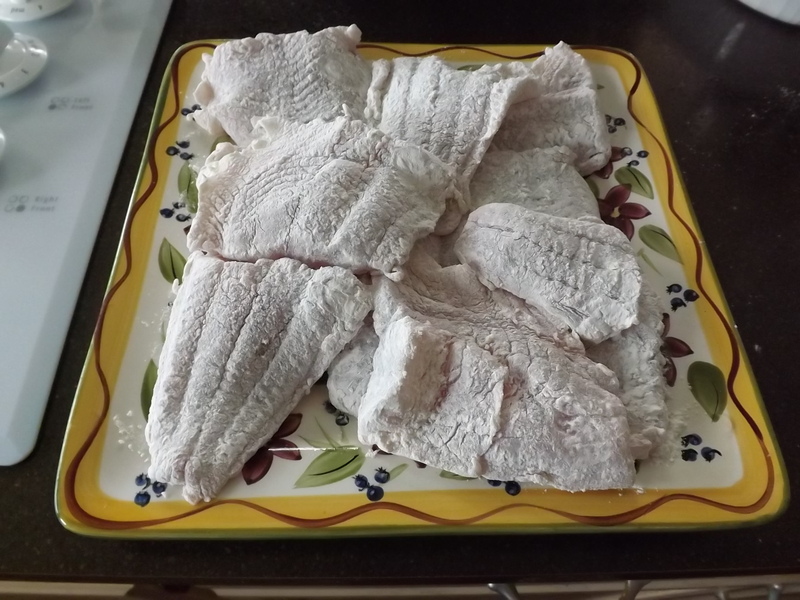 I’d never had walleye, but John told me it was excellent and similar to perch. After John left I mixed up some batter, cut the filets into strips, and deep-fried them. What a treat. 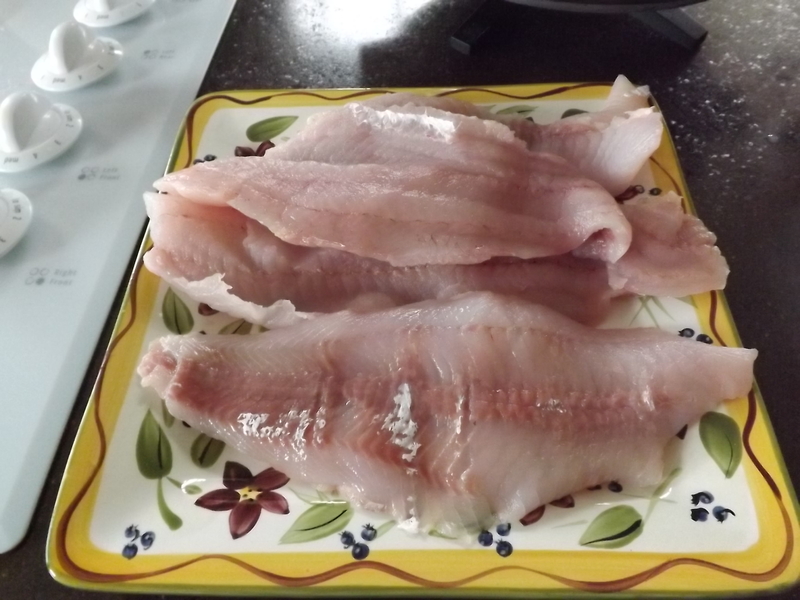 Living in Michigan, no more than 30 minutes from The Great Lakes, you’d think fresh fish wouldn’t be something new, but it was. Mix 1/2 Cup flour with salt – set aside. Combine milk and egg. Add to flour mixture and whisk till smooth. 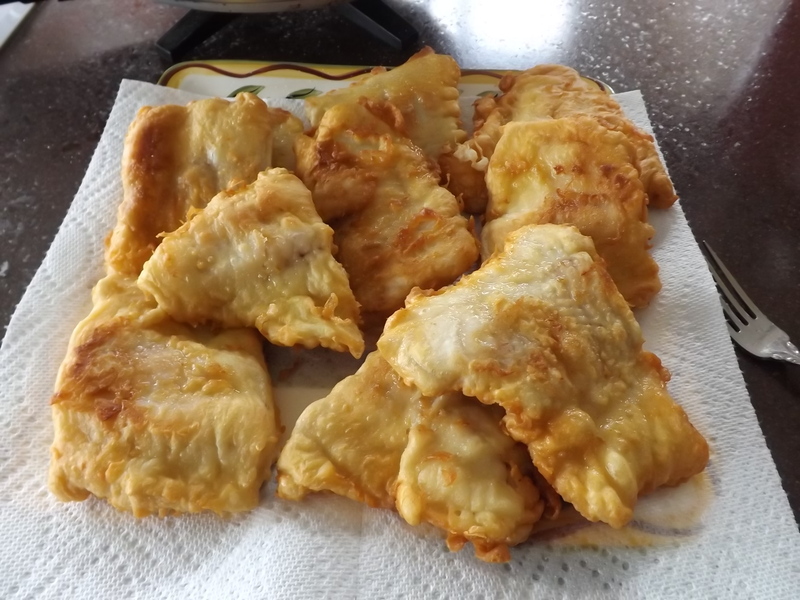 Dredge fish in remaining 1/2 Cup flour. 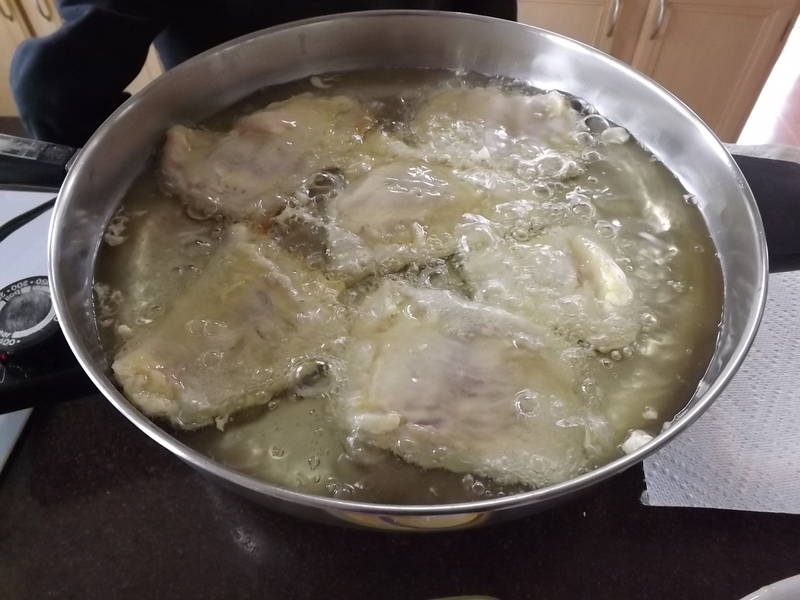 Fry battered filets in oil. Cook 2-3 minutes per side depending on thickness. It’s nice to know that there are still new experiences to indulge in, even after all these years, and for this I am — Simply Grateful. 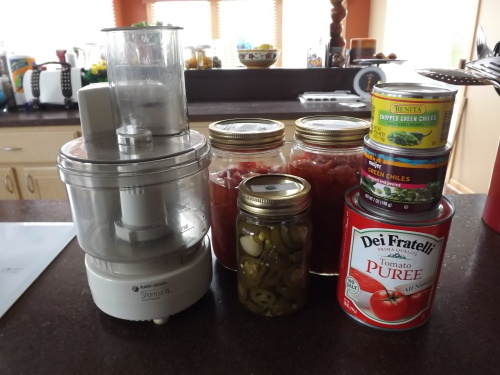 Pressure Canning Phobia — No More! In 1999 I bought my first pressure canner with hopes of pressure canning anything and everything. Thinking that bigger was better, I went for the 22 quart model. Little did I realize how intimidating pressure canning would turn out to be. I canned some beef stew and a few soup bases, but could never get over the fear of this pressurizing pot exploding in my kitchen. Silly, I know, but the fear stuck with me to the point that for twelve years the canner stayed packed away in its box. Last summer I decided I wanted to can my own pinto and Great Northern beans. When I found out these had to be pressure canned, I nearly backed away from the challenge, but decided the pressure canner had been idle long enough. I couldn’t let fear rule me. So I unboxed my pressure canner and set to work. What I didn’t know however, was that leaving such a pan idle for so long did have its consequences. After preparing my first batch of beans, putting them in the jars, placing them in the canner, and closing the lid, I waited. For over an hour I watched steam escape from every place except the top little spout. How in the world was this pan supposed to pressurize, if the steam kept getting out? Researching what the problem was, I learned the my gasket had more than likely dried out and this was making it impossible for the pan to seal. There were gaskets I could order, but what about the beans in my pan now? So, back to the Internet I went. Thankfully, there are a lot of people out there like myself that don’t have the patience to wait for parts or the desire to throw money at something when you are not entirely certain you’ve diagnosed the problem correctly. I found several people who described having a similar problem with steam escaping their pressure canner and they suggested using Vaseline to aid in the sealing process. I should have remembered this because I’d used this little trick before on hoses around the house. I removed the gasket, rubbed it entirely with Vaseline, replaced it, and then pulled out the rubber spout on the top of the pan and greased that up too. Returning everything to the pan, sealing it again, I waited. It took some time, but as the steam increased, less and less came out the sides and eventually there was only steam coming through the spigot at the top. Success. My jars sealed and I was happy. The only problem with my canner was the size. Most of the time, I didn’t need all the space in the 22 quart model I had. Sure it was nice to have when I was doing beans and could layer them, but if there were only a few pints that needed sealing, the time it took for this canner to pressurize was ridiculous. That is why I bought a 12 quart model when I found it at an estate sale a few weeks ago. Of course, the only reservation I had with buying a used model was whether or not the gasket was going to be good or not. Knowing I knew how to fix it, I took a chance. 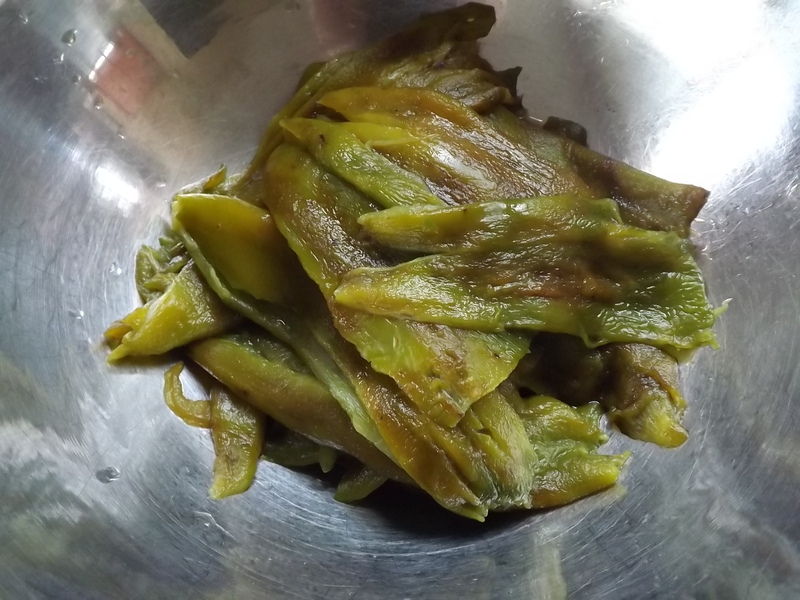 Yesterday I worked on canning green chiles that I found on the clearance rack at Meijer’s. I roasted the peppers on the grill, peeled them, seeded and cored them, packed them in 1/2 pint jars, covered them with boiling water and put them in the new canner. Thirty minutes after turning the burner on, steam was streaming through the top with only a slight leak under one of the handles. As the steam increased, the leak sealed itself and 45 minutes later I took the canner off the burner. 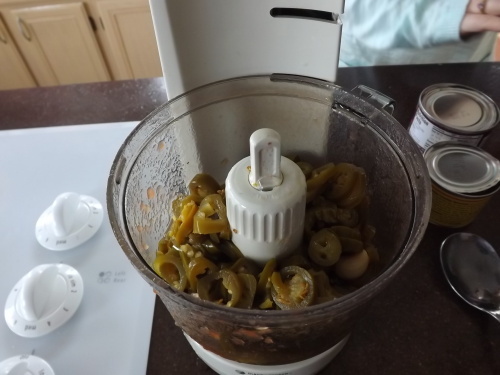 Once the pan had depressurized I opened it and found five jars of perfectly sealed green chiles. Awesome! I can’t wait to do more. Now that I know this can be so quick and easy, I am going to add several vegetables to my Canning To Do List for the summer. 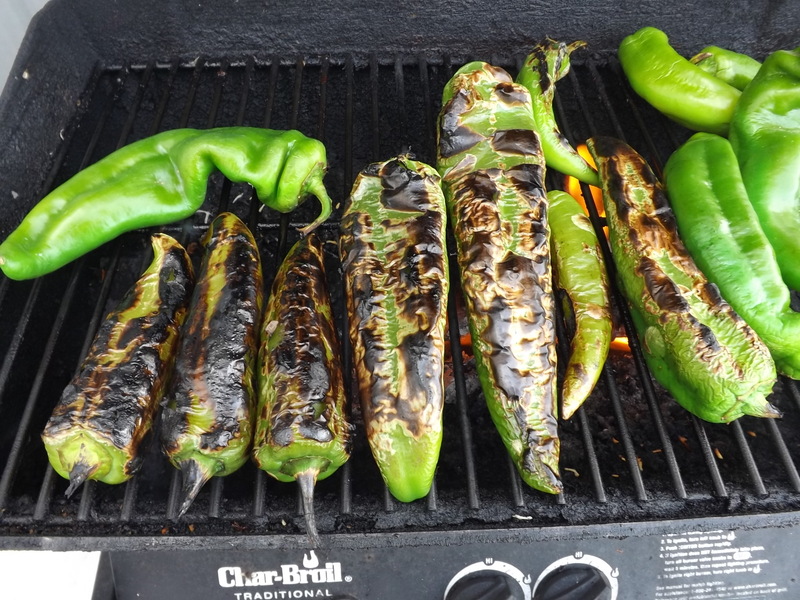 Start out by washing your green chiles and placing them on a hot grill. Grill over high flame, charing the outer skin. 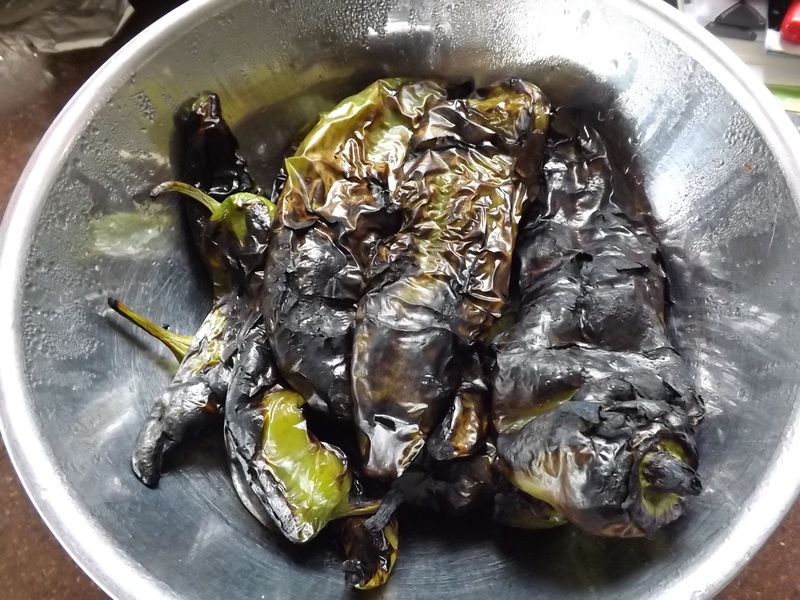 Place roasted chilies in a bowl and cover for 30 minutes. This will loosen the skins. Remove the skins. Doing this under running water makes it easier. 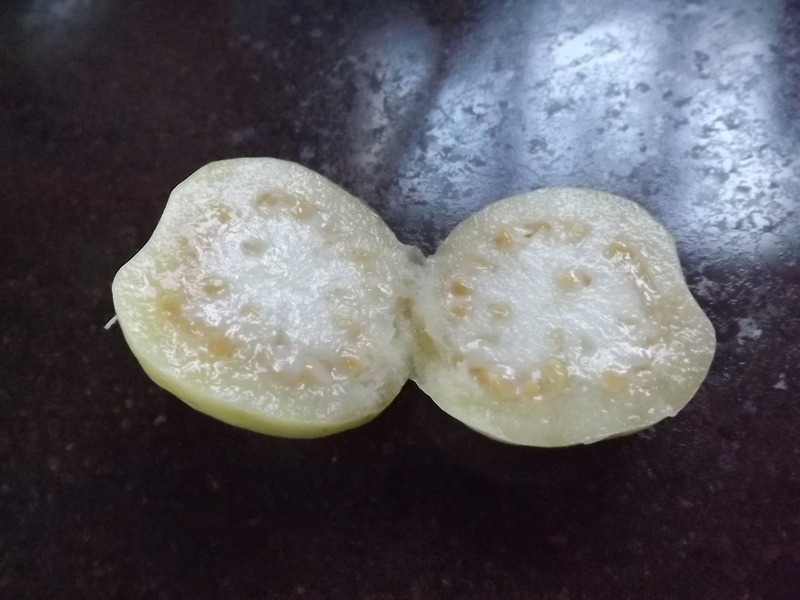 Remove the seeds and membranes. Slice or chop if desired. Pack into hot jars, cover with boiling water, leaving a 1“ head space. Top jars with hot lids and bands. 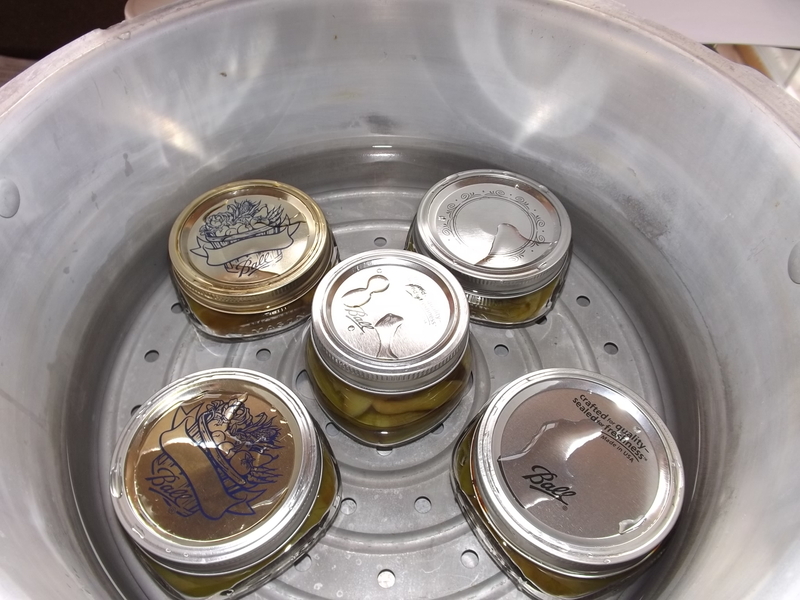 Place on pressure canner rack that has 2 – 3“ of water and put lid on. 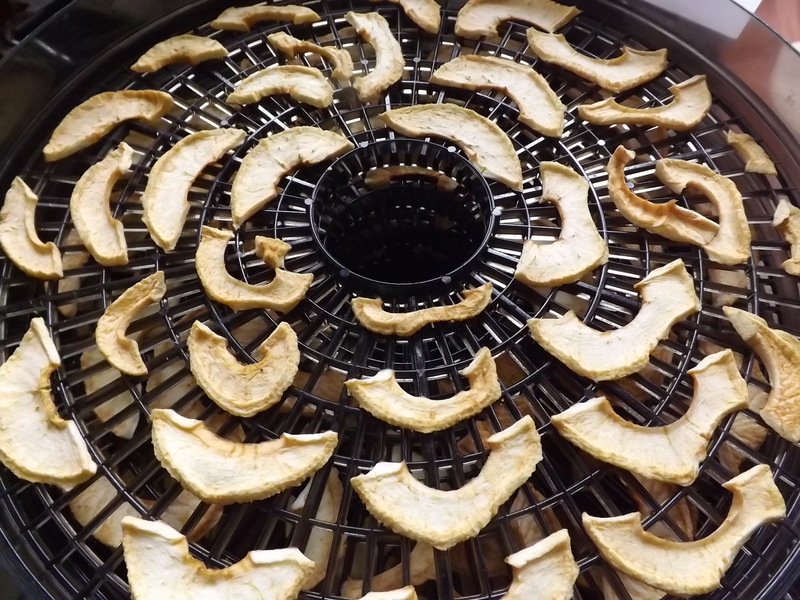 Turn burner to high and leave until steam flows through top for ten minutes. Place weighted gauge on top. Process for 35 minutes at 10 pounds. Let cool for one hour then open pan and remove jars. I am so happy this turned out and even more excited about all the canning I can tackle now that my fear of pressure canning is behind me. I can’t say that the thought of the pan exploding didn’t cross my mind yesterday as the steam built up and the gauge jiggled violently on top of the pan, but it didn’t explode and for this I am — Simply Grateful. Once I’d decided that Mexican was the choice for yesterdays menu, I went in the basement and pulled all the home-canned supplies from the shelves. 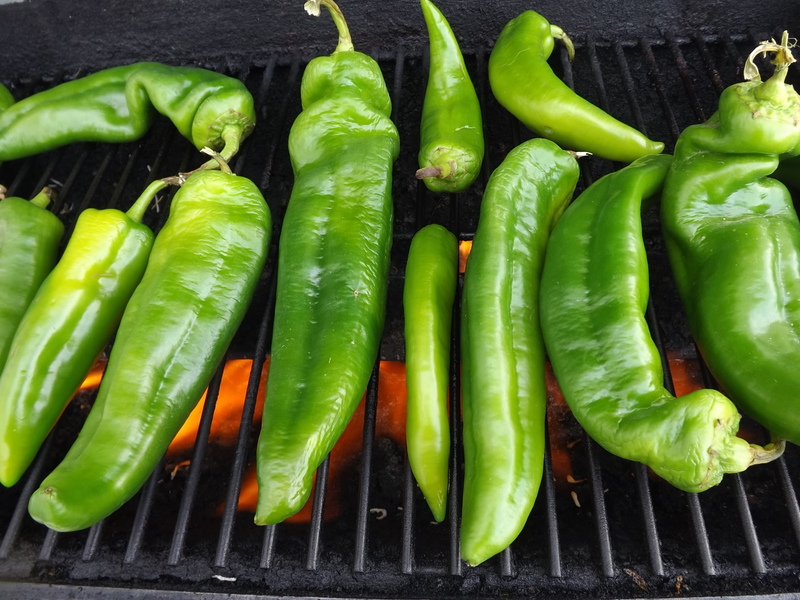 The most exciting part of making the meal was being able to use the jalapeno peppers I’d just canned a few weeks ago. I’m not sure why I never thought to can them myself years ago, but when you start thinking one way…it’s almost impossible to change. With the supplies at the ready, I opened first the tomatoes I’d canned last summer. Surprisingly these were my last two quarts. Good thing tomatoes are a constant during the summer. Having to wait until late August would be far too long a wait. 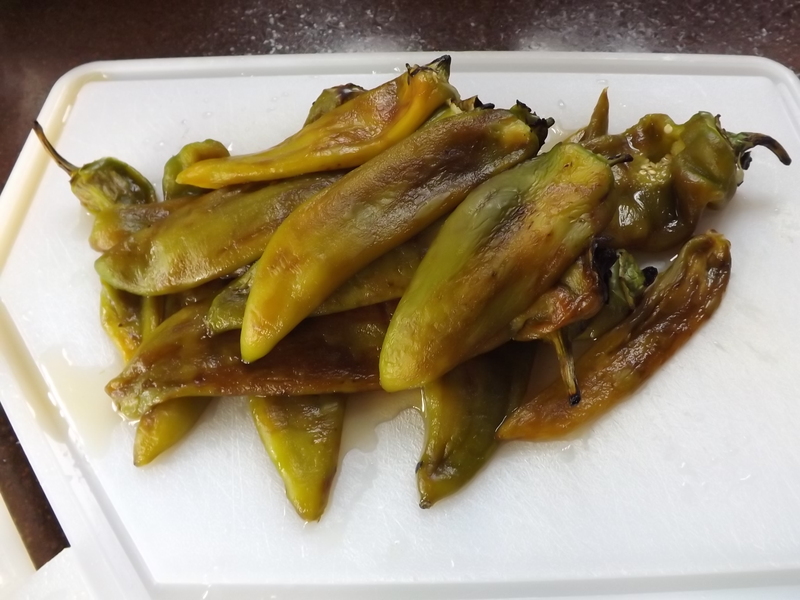 Once the tomatoes were pureed, I opened the peppers. Wow! My mouth began to water immediately. They smelled hot but I couldn’t control myself — I emptied the whole pint into the food processor and added the pureed paste to the tomatoes. My salsa isn’t very unique. 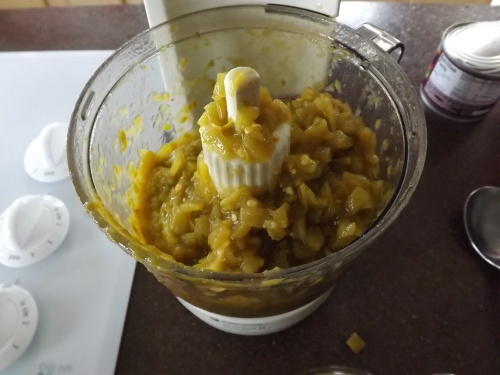 My family does not like it chunky, so most everything in it is pureed so that the chunks are small. I, myself do not like tomatoes. I eat them as a sauce mostly, but have never liked them raw. I think I have an alergy to them as well. Whenever I am in the garden trimming the plants or harvesting tomatoes, I end up with a rash all over me. Last year my daughter finally forbid me from going in the tomato garden. She took over so I wouldn’t spend the next day scratching and puffy. I have added fresh onion and green or red bell pepper to the recipe on occasion, but for the most part, this is how we enjoy it. Here is the recipe if you’re interested. 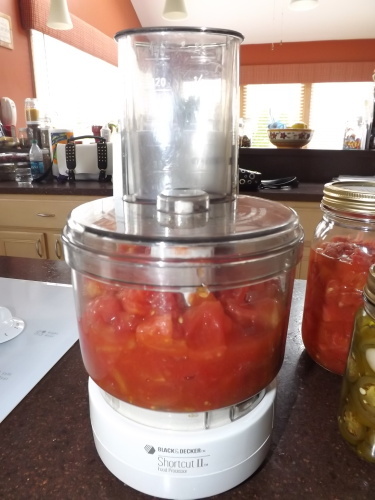 Put the tomatoes, peppers and chilies through the food processor and process to a consistency of your liking. 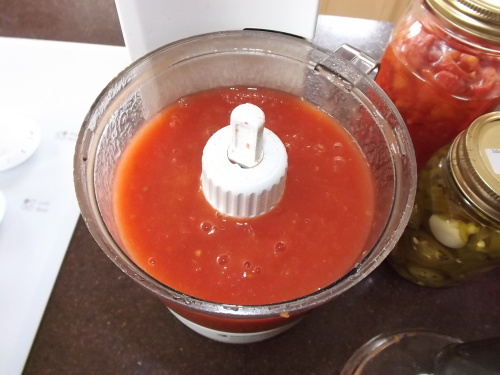 Add tomato puree (I add this to thicken the salsa, but if you don’t mind the salsa a little runny you can omit it). Stir and chill for at least an hour. This is really just a starter salsa recipe. There are so many more options with this base. You can add in freshly diced onion, peppers, tomatoes or our favorite — cilantro. You can make this your own with whatever your preferences are. 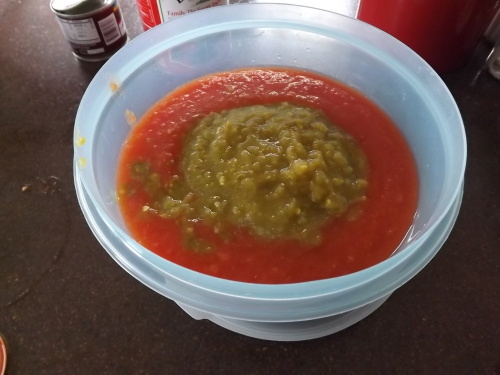 I have to admit that the full pint of peppers made the salsa very hot. I will be adding more puree to calm it down once we’ve eaten more of it. I’d add more tomatoes, but that shelf is bare. As luck would have it, yesterday I happened upon two bags of green chilies on the discount rack at Meijer’s. 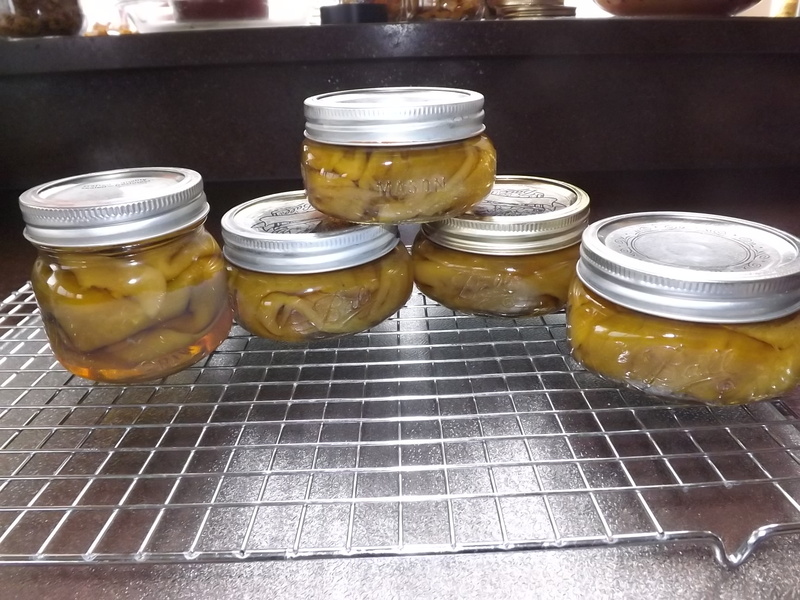 I had put canning these on my Canning To Do List for the summer. Of course, who can wait until summer when there are two bags for less than $2.00 staring you right in the face. I picked them up and plan on roasting them today and giving canning them a shot. They have to be pressure canned. I’m not as comfortable doing this, but I did just pick up a new 12 quart pressure canner at an estate sale, so no better time to try it out. After the salsa was done, I worked on the Mexican Tortilla Soup. Not sure where this recipe came from, but I have changed it so many times over the years, I’ll call it my own. 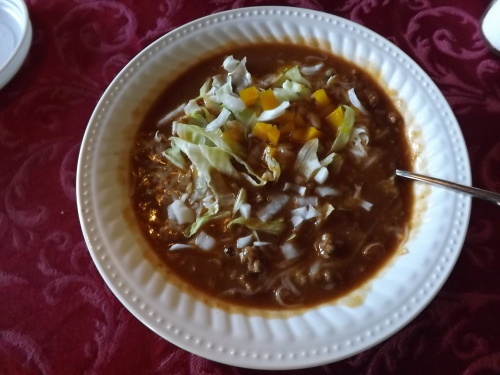 Here is that recipe, very easy and quite hearty (so hearty in fact that the family asked me not to make the tacos with it last night — they figured they be too full from the soup to enjoy them). Brown hamburger in large pot. Drain grease. Add remaining ingredients and simmer for at least an hour. I leave mine on the stove all day just because I like to have my dinner done as early as possible so I don’t have to worry about it later. It needs to boil about an hour to allow the spices and flavors to infuse the meat and broth, but after than you can just put it on low. Garnish with tortilla strips or broken tortilla chips, sour cream, shredded cheese, chopped green/red bell pepper, diced onion, shredded lettuce, chopped tomatoes, and salsa — whatever you put on a taco or a burrito, will go great in the soup. This soup is really more like a chili. Definitely substantial enough for a meal, but if you limit everyone to just one bowl (good luck with that) you could serve a main course as well. So, yesterday’s dinner is under my belt and seeing as I didn’t make the tacos last night, dinner is planned for today, and for this I am — Simply Grateful. Every morning it’s the same thing. What am I going to make for dinner? Until this question is answered, I cannot begin to tackle my to do list without that sword of Damocles dangling above my head. Of course the fact that my son’s first words to me each day, before uttering “Good Morning,” are “What’s for dinner?” doesn’t help much. You’d think there were a constant battle for food around here. I finally had to make a new rule: You are not allowed to ask me what’s for dinner until after lunch. Even then though I cringe when I hear those words. My husband will call during the day, interrupting whatever I am doing, to ask, “What’s for dinner?” At first I would tell him (if I actually knew), but after he told me once or twice after finding out what I was making, “Oh, did I tell you I have to work late tonight?” I stopped indulging him. Sure he might have been kidding, but planning dinner 360 nights a year can get stressful and I’m not always in the mood to play. As for my daughter, well she has reached that wonderful age where she thinks she can freely express her dislike for some of the things I prepare. Silly girl! Why in the world would she think she actually has a say in this? She doesn’t help with the planning, she certainly doesn’t “offer” to help with the preparation, and getting her to clean up is like pulling teeth, so until she has “earned” a say, she’d best tread lightly. A few years back I decided to write out a monthly menu. For six months I wrote a different meal in every box of the upcoming months calendar. This gave me a guideline for shopping lists each week and took the pressure off of constantly feeling like I had to come up with something new for dinner. The euphoria soon wore off though because the menu made me feel “tied down.” Although I certainly could have changed a planned dinner on the menu, seeing it in writing gave it a sense of permanence making me feel guilty if I didn’t follow it to the letter. I believed if I changed the menu for this one day, what was to stop me from doing it every day. And if that were going to be the case, what was the point of the menu? The weather was another factor when it came to following the menu. If the weather was hot and steamy typically grilling outside was better than heating up the kitchen even more with a huge pot of soup. Or if a cold front or thunderstorm suddenly decided to descend on us, which living in Michigan is always a distinct possibility, I surely wouldn’t want to find myself standing outside flipping burgers. One good thing that did come of the “Menu” was it forced me to make a master list of all the meals I make. Surprisingly I had enough dishes to go three months without repeating a single meal. That was good to know and in theory sounds really good, but there are some meals I like having more than once every three months. So, here I sit, staring at the dogs next door romping in their yard, listening to the birds chirping in the trees, waiting for the clouds to break up just enough to let a little sunshine into the morning, wondering What’s for dinner tonight? It isn’t supposed to rain, but the temperature is only going to be about 54°, so I don’t want to grill. It’s Wednesday, which means I have to make something with beef or pork. I haven’t made anything Mexican or Italian this week, so there are those options. There is leftover ham in the fridge — but that would be good for a snack for my husband after his workout. Everyone should be home by 4:00, so I don’t have to serve dinner in shifts. What really matters here is: What do I have all the ingredients on hand to make? Having to run up to the store for even one thing is not going to work today. Mexican! I always have everything I need for that. 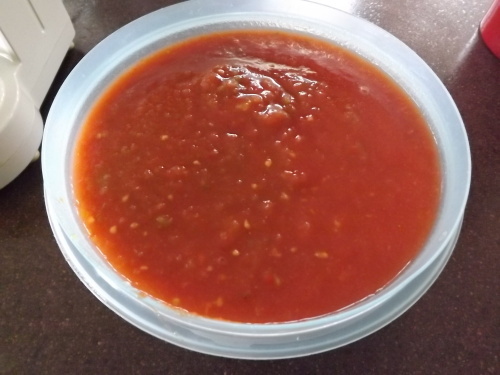 Soft and hard shell tacos sound good, with some fresh homemade salsa from home canned tomatoes and jalapeno peppers, and maybe even a pot of Mexican soup with home canned pinto beans. Done! Now I can get on with my day and not stress about “What’s for dinner?” Not tonight anyway, and for this I am — Simply Grateful. 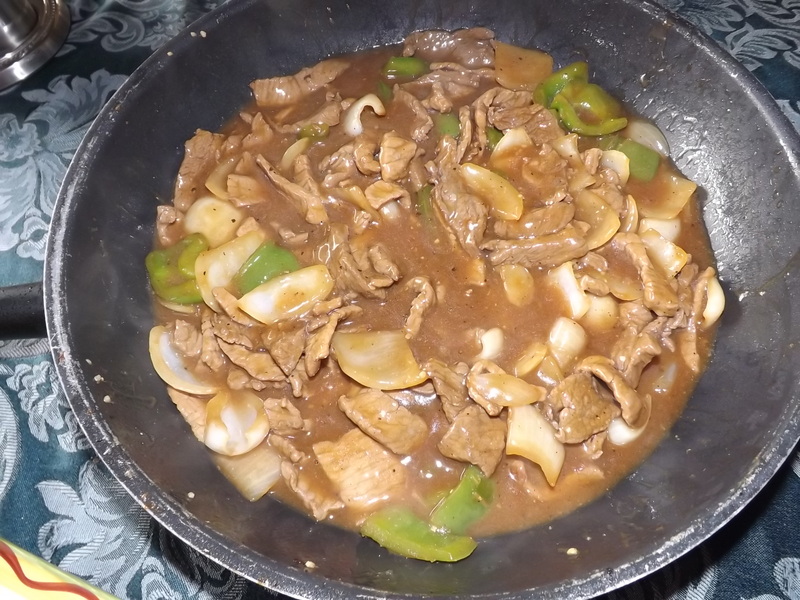 Combine beef, 1 tablespoon soy sauce, and 1 tablespoon xiaoshing wine in a bowl and toss to coat. 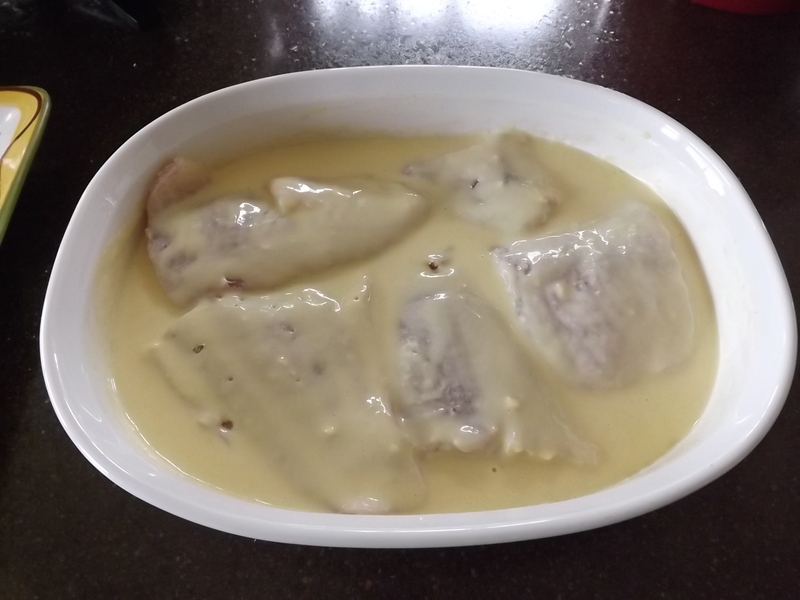 Let marinate for at least 20 minutes at room temperature and up to 3 hours. Meanwhile, combine remaining soy sauce with corn starch and stir with a fork to form a slurry. Add remaining xiaoshing wine, chicken stock, sesame oil, sugar, and pepper. Set aside. Combine peppers and onions in a bowl and set aside. Combine garlic, ginger, and scallions in a bowl and set aside.To Cook On A Burner: When ready to cook, heat 1 tablespoon oil in a wok over high heat until smoking. Add half of beef and cook without moving until well seared, about 1 minute. Continue cooking while stirring and tossing until lightly cooked but still pink in spots, about 1 minute. Transfer to a large bowl. Repeat with 1 more tablespoon of oil and remaining beef, adding beef to same bowl. Wipe out wok. Repeat with 1 more tablespoon oil and half of peppers and onions. Transfer to bowl with beef. Repeat with remaining oil and remaining peppers/onions. Return wok to high heat until smoking. Return peppers/onions/beef to wok and add garlic/ginger/scallion mixture. Cook, tossing and stirring until fragrant, about 30 seconds. Add sauce and cook, tossing and stirring constantly until lightly thickened, about 45 seconds longer. Carefully transfer to a serving platter and serve (I followed this part exactly and the meat was super tender and the vegetables were perfect). Making Chinese-style food for dinner is one I have struggled with for years. For some reason I have never been able to duplicate my favorite entrees’. This year it has been one of my goals to remedy this and finally have recipes that I would be proud to serve to guests. Last year I did manage to finally make a sweet and sour pork/chicken recipe that I’m happy with. This year I am working on Almond Boneless Chicken (I’ve almost got it, just need to tweak the sauce so it’s not too mushroomy), Chicken with Broccoli in a white sauce, egg rolls (I’ve made them with ground chicken and ground pork, but am still not satisfied), and pork fried rice. Trying new recipes is fun, especially when they actually turn out. I just love it when my husband tells me, “Yeah dinner was great — just don’t ever make that again!” That certainly boosts the old confidence. I know he’s kidding, but still, it does plant the seed of doubt. Pretty much the determining factor as to whether a recipe makes it onto the menu again is if I like it. If I’m not satisfied, it’s back to the drawing board. Once I actually like what I’ve made, and the family agrees it’s a keeper, then I can check that dish off my “to learn” list. Chinese Pepper Steak made it onto the menu board finally after three failed prior attempts. I can now move on to the next challenge in Chinese cookery which is always exciting, and for this I am — Simply Grateful. It is a perfect Michigan Monday morning. The temperature is around 63° at 10:00 and the sun is already high in the sky, beating down on me as I sit here on the patio enjoying a moment of peace before continuing on with the demands of the day. The birds are singing, filling the yard with their song and soothing my mind as it races with all that needs to be done. Already there are sheets and a quilt on the line stretched across the yard drying, the dishwasher has been run and is waiting to be emptied, the kids have been dropped off at their respective schools, my hubby is off to work with his lunch packed and ready for him to heat up, dinner is planned, and the dog has been walked. Not much more that I want to get done today, but that doesn’t mean there aren’t a ton of things to do. Walking through the yard this morning I stopped off at the lilac bushes on the side of the house. After the snow we had the other day, I figured any chance of blooms this year were gone. To my surprise, the blooms hadn’t sprouted far enough from the protection of the leaves surrounding them and they are just now starting to poke through. It looks like the bushes will be covered in blooms by Mother’s Day and then I can fill the house with the delicate lavender flowers and enjoy the sweet smell for days. Most of the bulbs I planted last spring didn’t make it through the winter. I think the squirrels got the majority of them and those they didn’t, the snow took last week. There are just a couple under the plum tree that appear to have survived. Hopefully the snow will not make another unwelcome visit and maybe I’ll get to enjoy a few flowers before the weather is consistently warm enough to plant some annuals. The plum tree is still bare. This isn’t out of the ordinary. Typically it doesn’t start to show signs of life until May, and late-May at that. Last year it gave us more than 120 pounds of usable fruit (more than 100 pounds had to be thrown out). I’m not sure if plum trees produce fruit every year. It had been three or four years since we’d gotten any usable fruit because of brown-rot, so I’m not sure what this trees cycle is. It would certainly be nice to get a bumper crop again. Although if you’d asked me last year while I was canning the 120 pounds of plum, I probably wouldn’t have been all that receptive to ever harvesting another plum. Thank goodness time calibrates perspective. The grass is still spotted yellow, but some green has pushed its way through the matted down clippings left over from the final cutting of the season last October. The grass should probably be ready to cut in the next couple of weeks, well on its way to the thick plush lawn I love. Today would be a perfect day to barbecue, but nothing sounded appealing when I was planning dinner for tonight. I finally settled on trying a new recipe for pepper steak. I have tried this meal several times in the past and have been left disappointed. Most of the time the steak is tasty, but nothing like the pepper steak served in Chinese restaurants. Thank God for the Internet because there are so many recipes out there to try I’m sure that one day I’ll get it right. So, although standing outside by the grill on such a beautiful day was tempting, I’ll just open all the windows in the kitchen and enjoy the fresh air as it streams through the screens. I really should head inside to work on the unending chores that await me, but the slight breeze tickling my arms reminds me that sometimes taking a break is more important than getting a job done. When I finally do drag myself away from this beautiful morning and begrudgingly continue on with my To Do List, I will take with me the memory of this time. Life is what you make of the moments were given. Appreciating this perfect Michigan morning is one of those moments worth holding on to, savoring, locking away inside. Moments like this ground me and for this I am — Simply Grateful.